Stainless Steel Kitchens, Inc. manufactures premium stainless steel cabinets and countertops for residential, commercial and institutional use. We pride ourselves on the quality of design and premium materials used in our cabinets and countertops. Cabinets are available in two series: Architectural (all stainless) and Designer (stainless over Russian birch plywood). Both Series are available in NSF and ADA configurations, and are available in standard and custom sizes. All of our countertops are made custom per our clients needs and dimensions. Our cabinets and countertops are proudly made in America. Stainless Steel Kitchens, Inc. is located in the Chicago Metropolitan area, but ships throughout the continental United States, Hawaii, Alaska, and the Caribbean. Our customers include architects, contractors, interior designers, and individual homeowners, in projects such as fire stations, operating rooms and doctors’ offices, demonstration kitchens, outdoor kitchens, and government facilities. Our employees have in excess of 40 years of stainless steel kitchen fabrication experience. 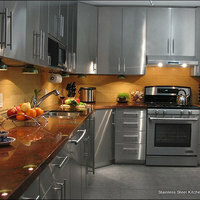 Stainless Steel Kitchens, Inc. is a woman-owned business, are members of the USGBC and NKBA, and are BBB accredited.